**Please note this pattern is for the Orange owl. If you would like to make larger or smaller owls increase or decrease rounds at the end of your owls body. Insert your hook into one of the front stitches of Rd32 of the body (The last Rd of the body), pull up loop and ch4, sc in same st. Then repeat this sequence around the entire base of the owl in the front loops only (Skip st, slst ch4 sc all in next st). Then fo. Now stuff your owl firmly. 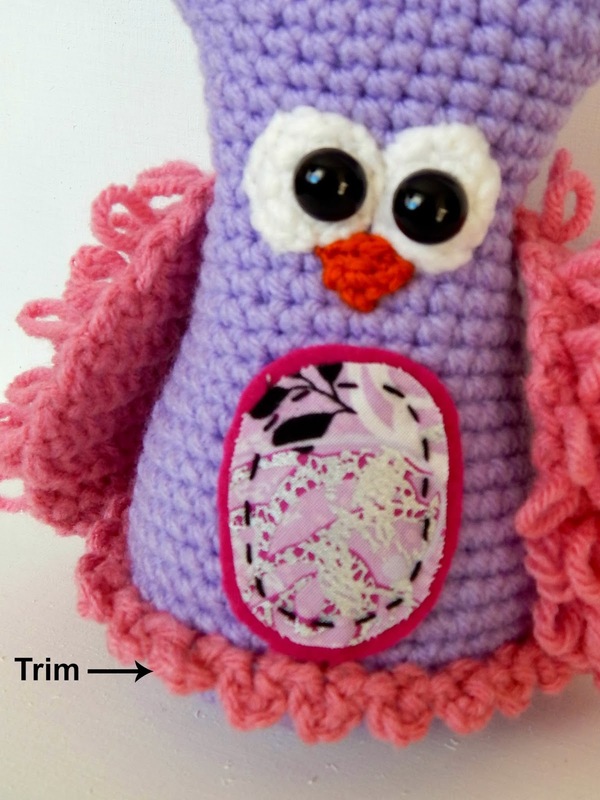 Sew on the bottom of your owl, sew it to the inside stitches of the last round of the body (Rd32). Sew on your wings. Add your safety eyes onto your eye patches. Sew your eye patches onto your owl. Sew on your beak. Then I cut little circles of fabric and felt and added them onto the owls belly.